Neil M. Perry is an artist and illustrator who grew up on the North East coast of England, currently living and working in Portland, Oregon. 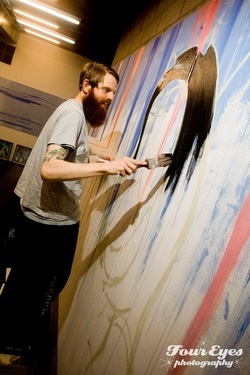 Neil has participated in group and solo exhibitions at galleries in Europe, the United States and Japan. Thanks largely to David Attenborough, he has been fascinated by the animal kingdom since childhood. This has driven him to develop a body of work which utilizes animal association, color psychology and recognizable patterns/symbols to engage in social commentary. Neil is always interested in learning about new opportunities for exhibitions and personal commissions.